I’ve spent the weekend beta-testing Interoute’s exciting new Virtual Data Centre proposition and I feel compelled to share my experiences. VDC, as its known internally at Interoute, is a recent technology development from the development group based in London. It attempts to fuse the flexibility and elasticity of public cloud computing offerings, with the home-territory of Enterprise VPN business to which Interoute’s dense IP/MPLS network has always been strong and dependable, having arguably pioneering MPLS VPN technology in Europe. As a well-known critic of poor implementations of virtualisation technology within Interoute, I was invited to participate in an early beta trial and comment freely. The general idea of Virtual Data Centre is to revolutionise the role of the typical Enterprise IT function in order to mutate today’s compute functionality into a utility resource as consumable as power or floor-space, while still maintaining the assurance, reliability, dependability and integrity of one’s own private enterprise network. Conventional public cloud offerings in this area from respectable competitors such as Amazon or Rackspace, have already demonstrated how virtualisation technology is changing the way that people think about compute power. Cloud-powered Internet technologies are found everywhere: whether it is latest version of the Sims game on Facebook, or the ubiquitous Dropbox dependable personal files folder. But the problem most enterprises have is the conundrum of how to capitalise on so-called “cloud-power” while retaining control of their own privacy and security. Most large-scale cloud compute implementations are, by their nature, Internet-based, since it is only Internet-scale that provides the volume that yields the skills and experience to operate a virtualisation platform correctly, completely and dependably. It’s also only Internet-based demand that provides the variation in demand that makes the an elastic compute capability viable: one customer’s peak usage is another customer’s quiet time. Private cloud or, to be more specific, the internal implementation of cloud compute facilities for sharing within the enterprise is often unable to offer the same level of benefit because of this lack of variation of demand. Within one organisation, demand synchronisation is highly likely meaning resource starvation is a very real possibility. This implicit association with the public Internet and viable cloud computing, then, is often troublesome for enterprise IT managers to accept. While enterprise applications providers such as Microsoft have taken strides recently to ensure that their client/server applications operate quite seamlessly whether making use of private network transport or whether using the public Internet, there are still a myriad of applications in common use in the enterprise space that simply don’t expect the Internet to be between them and their client user. But a managed VPN service provider, already operating in the space of corporate and enterprise WAN connectivity, is in an ideal place to take Internet packet economics, apply it to cloud compute functionality and make it a compelling platform for Enterprise IT managers. And this is what is happening at Interoute. Already providing the backbone transport across a large European footprint for Enterprises that have realised that operating WAN networks is a distraction from their core business, Interoute have architected a multi-customer-aware Virtual Data Centre architecture that attaches intimately with the MPLS VPN technology now accepted as a secure industry standard for providing isolated logical WAN networks for multiple customers using a common physical network asset. The result is a platform which allows a customer to view and manipulate the set of virtual resources in his enterprise network, via the very same web-based customer portal that he’s already used to using for routine maintenance of his VPN. Consequently, turning up a new server application in the enterprise network is transformed from the long wieldy process that used to involve hardware costing, space, cooling and environmental analysis, physical installation and software tuning, to a fast, responsive activity inline with the user’s business requirements. Access to the VDC Control Centre is via Interoute’s standard customer portal, or the Hub, as it’s often known. Customers log in with existing credentials and are immediately taken to a Flash-based enriched control panel that offers a visualisation of the current state of the Virtual Data Centre. The package the VDC team have offered me provides a generous 48 virtual CPUs, 150-odd GB of RAM, 6 VLANs and two distinct storage options: VM-specific and shared, and to allow me to try out the platform, my specific VDC has been associated to a special internal VPN that is used for providing services to a bespoke customer. Discussions are still underway, but I don’t think I’m stepping on anyone’s toes by suggesting that the pricing scheme likely to be offered is based on a combination of the resources consumed either on a fixed rental basis, or time-based. There is no real virtual-machine tax per se; one simply dimensions the VMs to make use of the resources in question. These resources deserve an explanation. Virtual CPUs, RAM and internal storage are all associated with a VM and these properties define the key performance characteristics. 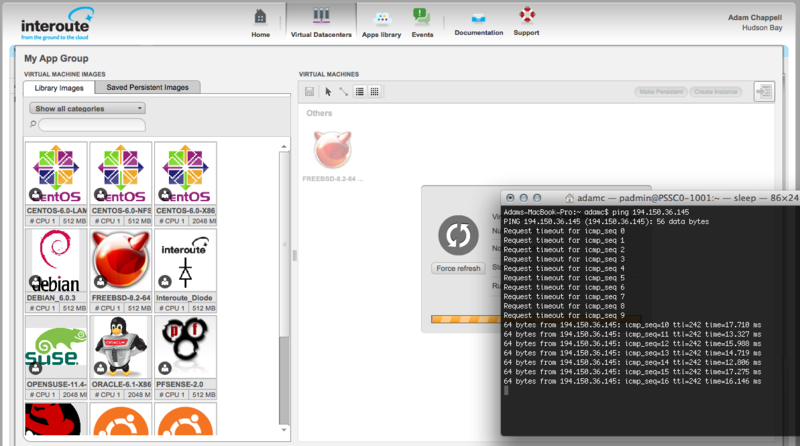 A VM’s use of these resources is defined in a template “image” defined in the ever-growing Interoute App Store library. For example, there is a basic vanilla Windows Server 2008 image, making use of 1 CPU, 50GB internal disk and 512MB RAM. There are possibilities to customise these images to adjust these properties, and I’m reliably told that a VM-importer will allow a customer to “bring-their-own” pre-built VM for execution, although it isn’t available presently. In order to cater for network applications on shared data, however – probably one of the common cases – the shared storage option allows the customer to specify an amount of storage space that can be made available using common storage protocols to VMs. In my opinion, it is this separation of application logic and data that is a vital distinction in allowing this technology to supersede traditional managed application hosting models. If I manage to somehow “break” an application’s operation, management or otherwise, recovery should be as simply as taking a new VM from the App Store library again. My data is quite safe. The final resource that requires a mention is the VLAN. By allowing a user to create separate networks, and attach VMs to these networks, it is possible to create quite complex multi-layer topologies mirroring conventional tiered data-centre applications. Double-clicking on the Virtual Data Centre in question – a customer can have more than one, associated with geography or availability zone – introduces the view of Virtual Appliances. While the terminology is at first confusing, one quickly realises that this is actually an “application group” and it allows a customer to easily operate several distinct cloud-based projects within a single VDC, pooling together compute resources into one lump, while keeping the necessary application and developers separated. I imagine the VDC team are likely looking at the possibility of defining users and groups and segregating administrative access to VM installations based on application groups. Within an application group, a user is given a very simplistic list-view or graphical view showing the virtual machines within the group and their current status. In the graphical view, the left hand-side of the screen shows a view into the Interoute App Store library, which is arranged by category and promises a variety of images from basic installed operating systems that users can further customise to free-standing OS/application combinations designed to just “deploy-and-go”. 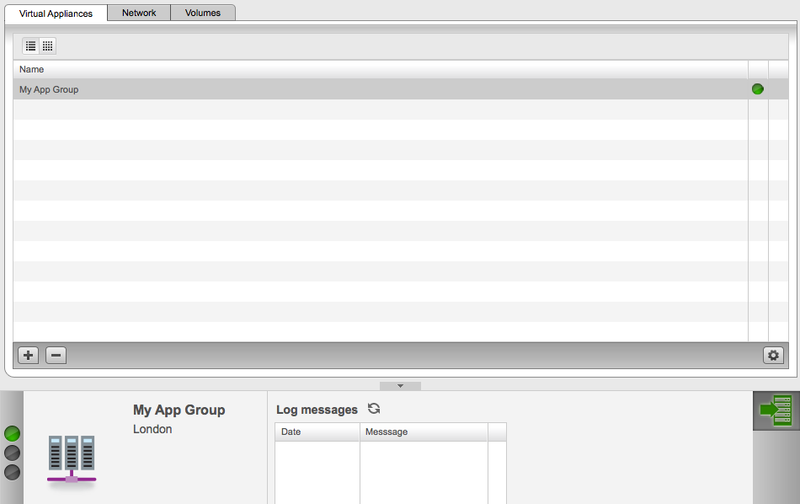 It’s a simple matter of dragging an image onto the blank canvas in order to add it in to the application group. For testing purposes, I ignore the plethora of Linux images, and select something reliable instead. I can, after all, I can easily change my mind! A lot easier than installing real NICs! 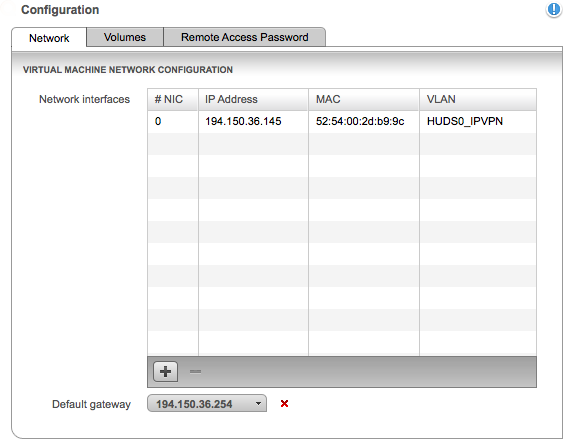 Once in place on my canvas, it’s also easy to modify some of the mutable properties associated with the VM: specifically, the external storage that is available and the networks that are attached, though helpfully, the software automatically selects the next free IP address in a pool of addresses that Interoute have nominated for default use in customers’ VPNs. I can modify this assignment as necessary, and add additional network interfaces or storage volumes. Once happy, I can simply click OK and then press the reassuringly-chunky flash-rendered power-button in order to “deploy” my VM. It lacks the tactile feedback, but is just as effective nonetheless. It is at this point that one realises the truly revolutionary potential for changing the way that Enterprise IT works. During my testing, I could simply drag an image from the library to the canvas and deploy it in under a minute. It booted in several seconds, and I could login to it to use it shortly afterwards. Granted, my “application” was simply a vanilla FreeBSD installation, and the VDC interface and concept still has a few little rough edges, but the experience of rapid deployment, installation and usability is compelling. What will be key is how quickly Interoute manage to grow their current App Store library to become a comprehensive one-stop-shop of ready-made Enterprise applications that can be deployed in-cloud and made available to users extremely rapidly. What will also be significant for more complicated applications will be the possibility to delegate the management of an application to a specialist or a channel partner. It’s quite likely that application service providers, currently in the business of providing applications to customers and hosting them, will be extremely interested by the idea of becoming a partner or reseller on Interoute’s VDC. Finally, I am curious to see how the technology may be used to enable a relatively new capability of staging and trialling. The speed of deployment means that it is extremely feasible for customers to “try-out” applications, almost without commitment. Interoute’s VDC development represents a recognition that that the unit of deployable application is fast-changing – from CD-ROM media in the 1990s, to downloadable source code, .tar.gz or .MSI file in the 2000s, to the ubiquitous .VMX/.VMDK virtual machine image of today . Through VDC, Interoute is providing a vehicle for Enterprise customers to host applications and functionality in a secure private cloud, where the distraction of hardware and OS maintenance is irrelevant and insignificant. I think it’s an exciting development, and I eagerly await early customer responses.